The town of Nassiedel is geographically located in the southwest of the district Leobschütz (Upper Silesia). The catholic church St. Jakob was built in 1880 by architect Carl Johann Bogislaw LÜDECKE . The places Nassiedel, Turckau, Jakubowitz, Liptin, Krastillau (Chrastilau), Ehrenberg, Osterwitz also called Nekasanitz or Niekasanitz, Klemstein, Hratschein (Ratschein), Leimerwitz, Hochkretscham (Wodka to 1778) and occasional village Kaldaun, have been recorded in the church register of Nassiedel. 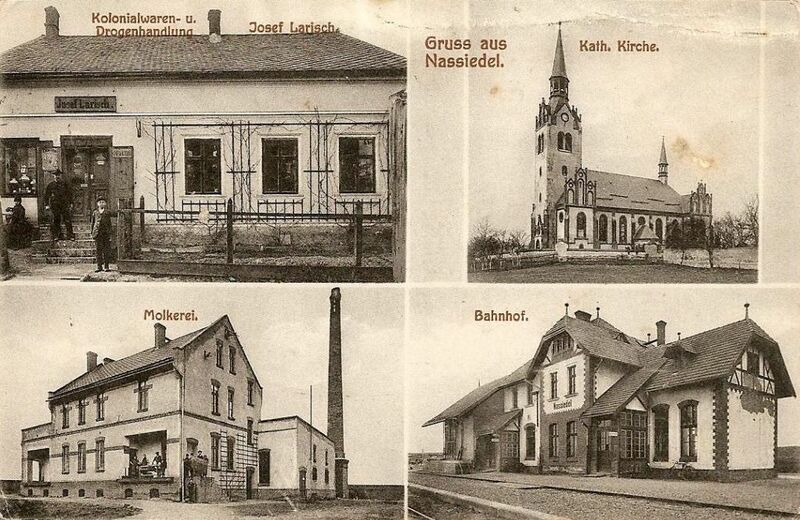 A local heritage book exists for the place Hochkretscham (Wodka). The local heritage book is under construction and will continue to be supplemented with data. Thank you for their kind support to all persons, which have transmitted further data in the meantime. I have tried to unify surnames whose spelling is similar and where familial relationships are suspected. For the correctness of my informations and for occurring errors, I can not guarantee. Supplements and corrections I accept gladly.